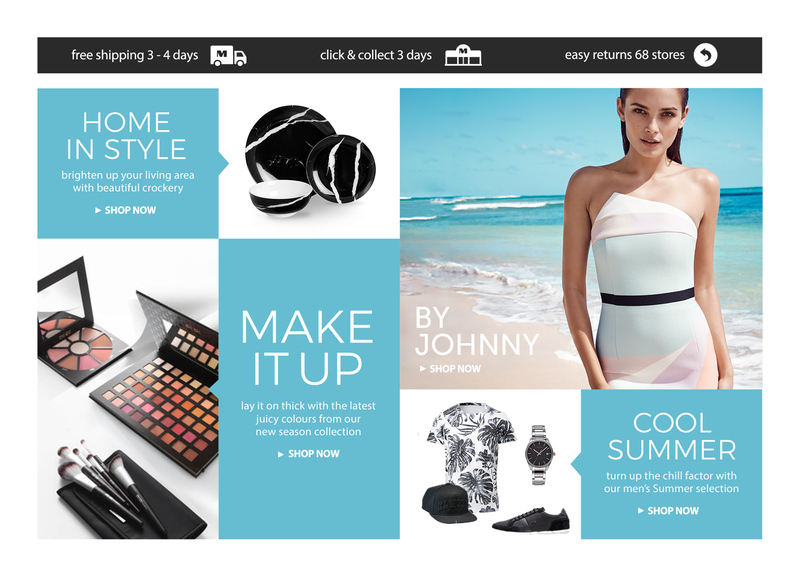 Myer is Australia's largest department store group, and a leader in Australian retailing. The Myer homepage is an entry point to all retail categories on the site, such as fashion, beauty, homewares and kids & toys. Content is updated daily, and ranges from branded campaign imagery to duration offers. The homepage also sees frequent reskins to accompany the launch of new catalogues. The homepage redesign therefore called for a modular structure, easy to update both in terms of content as well as the overall look and feel. Working with the Creative Director, I created three versions of the page - Designer Season Launch, Christmas catalogue, and Mid Season Sale. The hero slider is used to promote the latest campaigns, such as Designer Season Launch, as well as offers relating to the current catalogue. The slider also reflects content relating to newsletters which are sent daily to the customer database, and can include one-time offers, latest news as well as editorial content. The base section of the page includes rewards programs, latest content such as gift cards, online versions of current catalogues and links to videos of Livestream fashion events. The section has been designed in a modular and boxy no-frills way to enable easy updates to the content, which is frequently limited in terms of imagery. 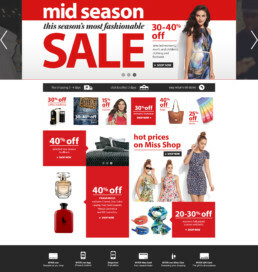 The Myer Mid Season Sale offers customers the chance to shop for a wide range of products at greatly reduced prices. The content on the home page is updated more frequently than in a non-sale period, to reflect the in-store and online duration offers. The modular structure of the redesigned homepage allowed us to seamlessly implement global overhauls to the look and feel, as well as last-minute content updates. A solid grid structure, design templates, and campaign-specific brand guidelines meant minimum time spent in both design production and in build. 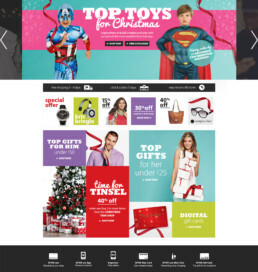 The Myer Christmas catalogue usually includes a myriad of colours, campaign imagery and product offers. The simplified structure of the redesigned homepage made both the content and the look and feel update seamless, and the featured content section of this page helped to direct users to the most salient offers.